Composed by Eric Thompson. Style, Boxed, Technique, Theory and Reference. Grossman Guitar Workshop. Bluegrass. DVD. Duration 86 minutes. Grossman's Guitar Workshop #GW603DVD. Published by Grossman's Guitar Workshop (MB.GW603DVD). Crosspicking is an exciting flatpicking technique that is an essential part of every bluegrass guitarist's arsenal. Utilizing repeated patterns on three-string groups, crosspicking captures the bounce of a fiddler's double shuffle and the drive of three-finger banjo Scruggs-style rolls. Eric Thompson lays it out for you in easy to understand steps, illustrating the basic patterns with arrangements of Fly Around My Pretty Little Miss, Blackberry Rag, Beaumont Rag, Wildwood Flower, and Crosseyed Fiddler. Split-screen close-ups let you see exactly what and how Eric is playing. 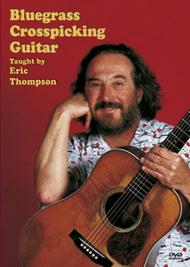 A detailed tab/music instructional booklet is included as a PDF file on the DVD.